Host Danny Leroux (@DannyLeroux) and Matt Moore of The Action Network (@HPBasketball) lay out their playoff tiers but with players instead of teams. They discuss the difference between player quality and importance, who can win their team a game or series, who has the most boom/bust potential and much more. Sponsored by Betonline.ag, CBS Sports HQ and TrueCar Subscribe to RealGM Radio on iTunes or via the RSS feed. Host Danny Leroux (@DannyLeroux) and Kevin Pelton of ESPN (@kpelton) break down all eight playoff series after two games. They discuss Portland's early success against Oklahoma City, whether teams like Brooklyn and San Antonio can build on their road wins and much more. Sponsored by Betonline.ag and TrueCar Subscribe to RealGM Radio on iTunes or via the RSS feed. Host Danny Leroux (@DannyLeroux) and Tim Bontemps of ESPN (@TimBontemps) break down the Eastern Conference playoff picture. They discuss how the Bucks, Raptors, 76ers and Celtics are looking going into the postseason in terms of how they are playing, health and the massive long-term ramifications looming for all four franchises. Sponsored by Betonline.ag, CBS Sports HQ and TrueCar Subscribe to RealGM Radio on iTunes or via the RSS feed. Host Danny Leroux (@DannyLeroux) and Tom Haberstroh of NBC Sports (@tomhaberstroh) analyze playoff momentum and the MVP race. They discuss his new piece on whether teams that enter the postseason hot actually play better, rest in the modern NBA, Giannis vs. Harden and much more. Sponsored by Betonline.ag, CBS Sports HQ and TrueCar Subscribe to RealGM Radio on iTunes or via the RSS feed. Host Danny Leroux (@DannyLeroux) and his biologist sister continue a family tradition by going through the full NCAA Tournament bracket as if the schools' mascots were fighting. Subscribe to RealGM Radio on iTunes or via the RSS feed. Host Danny Leroux (@DannyLeroux) and draft expert Sam Vecenie of The Athletic (@Sam_Vecenie) preview the NCAA Tournament, focusing on 2019 NBA Draft prospects. They discuss Zion Williamson's return from injury, Ja Morant making March Madness, players who can affect their draft stock and much more. Sponsored by Yahoo Daily Fantasy (yahoo.com/DailyFantasy) CBS Sports HQ, Peter Millar (petermillar.com/realgm), Betonline.ag and TrueCar Subscribe to RealGM Radio on iTunes or via the RSS feed. Host Danny Leroux (@DannyLeroux) talks with both Jared Dubin (@JADubin5) and Aaron Larsuel of The Official Lakers Podcast (@AaronLarsuel) about the Lakers in separate conversations. Jared and Danny discuss the rise of zone defenses, Eastern Conference hierarchy, lottery reform and much more while Aaron breaks down what happened to the Lakers after the All-Star break, analyzes their young talent and who fits with the team moving forward. Sponsored by Betonline.ag and TrueCar Subscribe to RealGM Radio on iTunes or via the RSS feed. Host Danny Leroux (@DannyLeroux) and Matt Moore of The Action Network (@HPBasketball) lay out their tiers for the entire NBA. They discuss whether the Warriors are alone in the top tier, how they separate the possible championship contenders, whether team's recent successes or struggles are predictive of where they are going and much more. Sponsored by Betonline.ag and TrueCar Subscribe to RealGM Radio on iTunes or via the RSS feed. 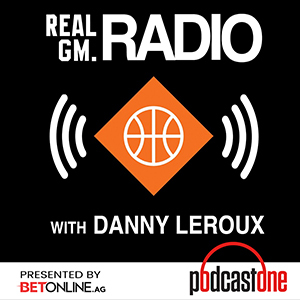 Host Danny Leroux (@DannyLeroux) and Dan Feldman of NBC's Pro Basketball Talk (@DanFeldmanNBA) discuss the current state of the NBA and look towards the offseason. They discuss Eric Bledsoe's extension, Milwaukee's massive summer, which teams have the biggest uncertainty in July, their desired playoff teams and much more. Sponsored by Peter Millar (petermillar.com/realgm), Betonline.ag and TrueCar Subscribe to RealGM Radio on iTunes or via the RSS feed. Host Danny Leroux (@DannyLeroux) and draft expert Sam Vecenie of The Athletic (@Sam_Vecenie) catch up on 2019 NBA Draft prospects. They discuss Zion Williamson's injury and decision, the impact on his Duke teammates, Sam's big new project, the 2019 offseason and more. Sponsored by Betonline.ag, Art of Sport (ArtofSport.com) and TrueCar Subscribe to RealGM Radio on iTunes or via the RSS feed. Host Danny Leroux (@DannyLeroux) and Kevin Pelton of ESPN (@kpelton) talk about the state of the NBA after the trade deadline. They discuss the new hierarchy in the Eastern Conference, what they are watching between now and the playoffs, potential impacts on 2019 free agency and much more. Sponsored by Peter Millar (petermillar.com/realgm), Art of Sport (ArtofSport.com), Betonline.ag and TrueCar Subscribe to RealGM Radio on iTunes or via the RSS feed.